Okay, it’s the morning after Day One of the reign of President Donald J. Trump, and “I don’t feel fine” (to contradict the chorus-line clincher of R.E.M.’s old anthem, “It’s the end of the world as we know it (and I feel fine)”). Or does the swearing-in ceremony and the inaugural address not count as Day One? Maybe Day One is today. Or since today is Saturday, maybe Day One doesn’t commence until Monday, the first working day. Whatever, by the end of the week, Mein Trumpf will have built the wall between the U.S. and Mexico, cashed the check Mexico sent to pay for it, eradicated Radical Islamic Terrorism from the face of the earth and the colonoscopied bowels of hell, banned various categories of people – Mexicans, Muslims, and Gay Pride Toronto — from joining the “huddled masses” at the feet of the Statue of Liberty, squashed Obamacare like a bug, retrieved the millions of stolen jobs from China (plus China will be grovelling on its knees, begging the Big Energizer Bunny not to put a 35 percent tariff on Chinese-made T-shirts and Energizer Bunnies), and He will look upon what He hath wrought (or is the past tense of “wrought” actually “wrath”?) and declare, “We are winning — bigly!” And then the Big League Guy will rest on the seventh day or grab a – no, no, not going there. 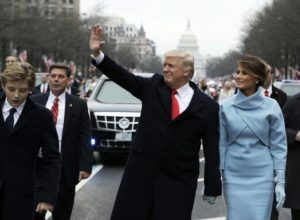 I know, I know — I should be writing about Trump’s inaugural speech, the one where he says, “This American carnage stops right here and stops right now.” But by the time I got up on the morning after, everybody in the left-liberal mealymouthed Mainstream Media (MSM) had already analysed every lie in the speech. So, there’s really nothing left to do except to practice some Toronto Globe-and-Mail-columnist-Margaret-Wente-style plagiarism, except I’ll put the quotes in quote marks and cite the references in order to avoid the unpleasantness of being called a cheater writing about a liar. Copied or not, I recognize it’s my duty to write about you-know-who, given that we’ve all been conscripted into the New American Civil War, and will be in the cyber-trenches “for the duration,” as they say in the military. Actually, you don’t even have to go to the left-wing of the Left Liberal MSM to get the story. You can just read Jennifer Rubin, the Washington Post’s official right-wing columnist. She nails it. 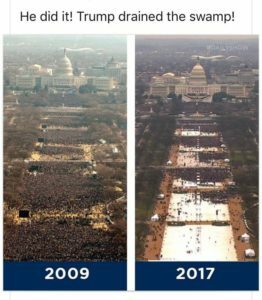 Sparse crowds at Trump inaugural. Trump dutifully denounced the evil “establishment” six ways to Sunday. Or as Rubin puts it, “In other words, the ‘establishment’ that he now sits atop has betrayed the country. He did not say they were shortsighted or mistaken. He did not say they made progress but left work to do. He attributes unvarnished malice to the entire establishment, dividing it from the ‘people’.” The latter, you’ll be happy to know, will now be exclusively represented and protected by The (“I alone can fix it,” “I am your voice”) Donald. Rubin replies, “You would not know that unemployment stands at 4.7 per cent, crime is down and productivity is up,” not to mention that illegal immigration is down and that more Americans have health insurance than ever before (thanks to Obamacare), but still not as many as have health insurance in more civilized parts of the world (um, e.g., as in Canada, with its socialistic single-payer health care system). There are a lot more facts and figures that help explain why almost 3 million more Americans voted for Trump’s opponent than for Trump, and why former president Obama left office with unusually high 60 per cent approval ratings. The second part of the speech, Rubin notes, “was a dark, ugly tribute to ‘America First,’ the language of nationalism, nativism and protectionism. One cringes to hear the president use the phrase of the Charles Lindbergh, fascist-sympathising set of the 1930s.” By the way, I wonder how many of our “deprived of all knowledge” students would even recognize the name of trans-Atlantic aviator Lindbergh? Rubin continues, Trump “puts forth a demonstrably false narrative that we benefited other countries at the expense of our own. He sees no benefit from markets we have developed, from collective security, from the spread of democratic governments, from the prevention of violence on the scale of the two 20th century world wars.” Gee, columnist Rubin is sounding not like a conservative but a, dare I say it?, a l-l-liberal. And she’s making Trump, with his denial of the glories of global markets, collective security, the spread of democracy, and his denunciation of U.S. imperialism, sound like a member of the Regressive Left. I watched some of all of it, from swearing-in to inaugural speech to police stun grenades bursting among the protestors at the corner of 12th and where?, and I heard CNN’s resident historian, Doug Brinkley, author most recently of Rightful Heritage (2016), say that he thought Trump’s speech was pretty good. And I still don’t feel fine. In fact, I don’t feel so good at all.